I have a question that you may be able turn into a project. I am working on an idea that requires as much preasure as i can get out of a hose coming out of the end of a hydrualiv piston. Imagin the standard theary preasure ratios that apply when you run a hydraulic ram. I want the reverse. Which i know will give me a very low preasure coming out of the small hose. My question is. Would you get a significat increase in preasure if the exit hose was at the end of a cone? That is, if the oil, instead of hitting a perpendicular surface & then finding its way out a small exit diameter hole, where to instead, be funneld towards the hole, by shaping the normally flat end of your piston chamber, into a cone shape. Well if you can follow what i am trying to do & think it may be interesting then drop me an email & i can send a diagram. or maybe its not the type of challenge you where looking for. I see your diagram, but am confused. On the one hand you talk about wanting as high a pressure as possible in the hose, but on the other you say you know it will give you low pressure. Based on the diagram you've posted, I would point out that, ignoring the relatively minor effects of fluid flow effects and pressure head, the pressure in the fluid will be the same throughout its entire volume. The pressure at the motor port will equal the pressure immediately below the piston. That pressure multiplied by the area of the piston will give you the force required on your piston rod. The effects you discuss of the momentum of the fluid impacting the cone surface only has real significance if the velocity is relatively high. And since you want it to drive the hydraulic motor, the pressure drop will be pretty low. Are you thinking that the pressure of the fluid will be higher at the cone outlet than at the inlet? The velocity will be higher, but not the pressure. You are right and, have answered some basic questions which i have been trying to figure out. So it looks like my theory won't work. I am trying to use the method in the diagram to drive the motor. Working on what you have written. If i had 1000PSI pushing on the piston then i would have 1000psi at the motor. But the Horse power would be greatly reduced. So i would require a much greater pressure force at the piston in order to maintain the power output of the motor. 1. "Horse power would be greatly reduced"
Compared to what? It is what it is. 2. What do you mean by "maintaining the power output of the motor"? Again, compared to what? It is what it is. 3. You use the phrase "pressure force". Which do you mean? Pressure or force? They are two different things. Example - if the fluid PRESSURE is 100 PSI and the area of the piston is 4 sq. inches, then the FORCE on the piston is 400 lbs. LBS and LBS/SQ.INCH are not the same thing. Basically the cone shape buys you nothing. 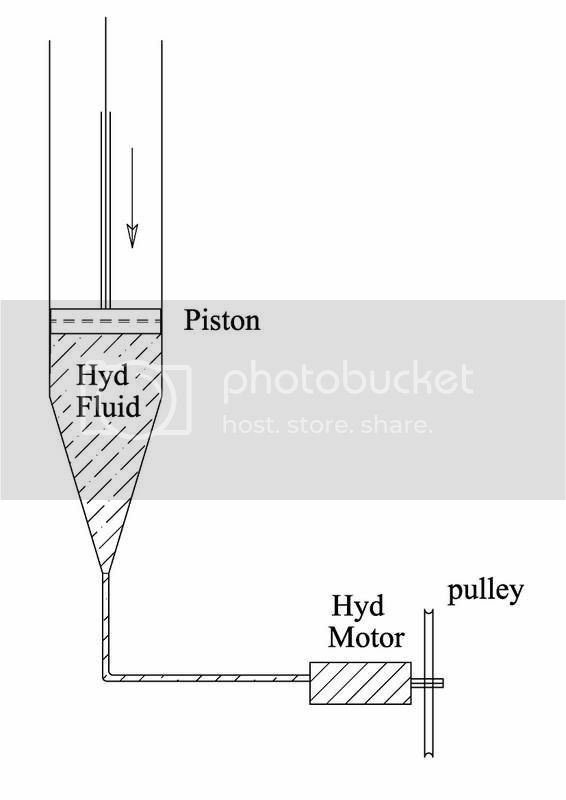 The factors in play here are piston area, outlet area, fluid volume, and fluid pressure. What is it that you are trying to accomplish here? I don't understand. There are many ways of driving a hydraulic motor. To put it simply and neglecting losses, the force applied to the piston, multiplied by the distance the piston travels, divided by how long it takes the piston to travel that distance will be the power you get out of the motor. The horsepower would not be greatly reduced - it would be the same. Power in is power out when neglecting losses. You must discount that power by the fluid losses in the piping, piston friction, and efficiency of your motor. Thanks for your comments & sorry I have taken so long to reply. I don't have a mechanical background, I work in the surveying profession. So please try & bear with me. So, I will try & explain what I am trying to do. I am building a green power generator, which will push down on the piston shown in the drawing above. It has a limited stroke but the force can be huge, with 100 tons or more possible. I am trying to produce a small prototype for demonstration purposes & have bought a small Charlin hydraulic motor for this setup. I have been trying to get my head around the properties of hydraulics & as you can see, what I am trying to do is run it in the reverse of the normal way you would have a hydraulic ram work. So as Swearingen has said, I am probably wasting my time with the cone shape at the bottom of the piston & he also said that "power in is power out". Correct me if I am wrong. If I was to use the diagram above, there would be very little torque available in the pulley. That is, as you are pushing down with a piston having an area of say 0.3 square meters & a hose at the bottom with an area 0.03 square meters, you would have a reduction ratio of 10:1. This is how I understand it. Can you let me know if you agree with this? If I have the basic fundamentals correct I can start working with these figures & the gearing of motors in order to create something that is capable of turning fast enough & with enough torque to produce electricity. Any more help you can offer is greatly appreciated.